In these pointed and wide-ranging essays, Wendy Willis explores everything from personal resistance to the rise of political podcasts, civic loneliness to the exploitation of personal data, public outrage to the opioid crisis--all with a poet's gift for finding the sacred in the mundane, a hope in the dark. One of the country's sharpest observers of politics, art, and the American spirit, Willis returns often to the demanding question posed by Czech writer, activist, and politician V clav Havel: What does it mean to live in truth? Her view is honed by her place as a poet, as a mother, and, when necessary, as an activist. 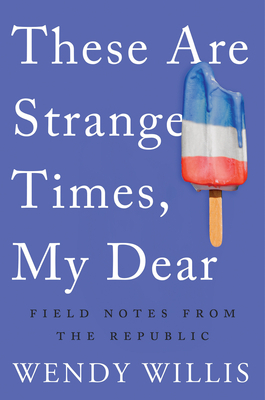 Together, the essays in These Are Strange Times, My Dear work within that largely unmapped place where the heartbreaks and uncertainties of one's inner life brush up against the cruelties and responsibilities of politics and government and our daily lives. WENDY WILLIS is a writer living in Portland, Oregon. Winner of the Dorothy Brunsman Poetry Prize, she has published two books of poetry. Willis is a lawyer, the executive director of the Deliberative Democracy Consortium, and the founder and director of Oregon's Kitchen Table at Portland State University.